Are you looking to purchase a convertible car seat for your bundle of joy? In this buyers guide, we look at the best convertible car seats on the market in 2019 and have done a thorough analysis to come up with the best of the best. There are many on the market and it may be overwhelming to determine which ones are right for you. We have taken the guess work out of finding the best convertible car seat and have made it easy for you to pick one that suits you and your families needs. A well-built convertible car seat will function as an essential safety feature for your child in the event of a traffic accident. 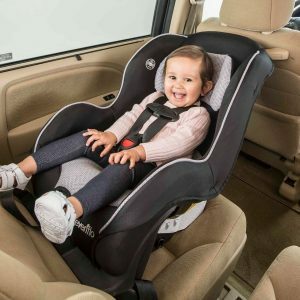 Unlike infant car seats which come with a detachable seat (many easily connect to strollers), convertible car seats can grow with your child and provide dedicated transportation inside a vehicle. Children should always remain rear-facing until they are about two years old, at which point you can switch their convertible car seat to face forward. They are securely fastened to the car’s seats using the seatbelt mechanism, and they provide an essential level of physical security for children and peace of mind for parents. Are Convertible Car Seats Right For You? Are you interested in purchasing one car seat for your child’s entire life? Or did you already purchase an infant baby seat, and now need something bigger? If you answered yes to either question, then you should shop around for the right convertible car seat. A convertible car seat is perhaps the most widely recognized signal that your baby is no longer an infant, but not yet a small child capable of riding in a car unassisted. Children spend more time in convertible seats than any other form of transportation, so it is crucial that you find the right model for your situation. We will pay close attention to how easy each model is to install as well as its durability, convenience, and (most importantly) its safety features. It is with these three things in mind that we will evaluate some of the best and most reputable brands on the market. 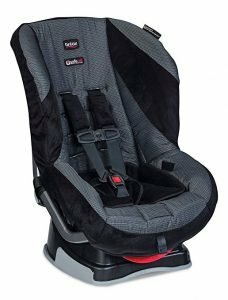 When it comes to purchasing a convertible car seat, the four most widely recognized brands on the market are Graco, Britax, Evenflo and Chicco. Each brand offers a variety of models to fit different budgets. As you will see, convertible car seats come with a variety of different features and safety mechanisms depending on your budget. You can find a product that accomplishes the most important feature—the safety of your child—without draining your bank account. The Graco is the My Size 65 model is one of the more popular Graco convertible car seat on the market. This unit is specially designed to accommodate an infant as small as 4 lbs. or a child as big as 65 lbs. The unit itself weighs just under 20lbs, making it light enough to comfortably carry with one hand. The seat is only 19 inches in depth—small enough to be the perfect fit for any vehicle. It comes with a five-point harness system and a machine-washable cushion (which is a must-have for long road trips). Graco ensures that all its car seats can withstand rigorous crash safety tests, and the My Size 65 is no exception. This car seat also comes with a cup holder on the (baby’s) right-hand side, which is essential. 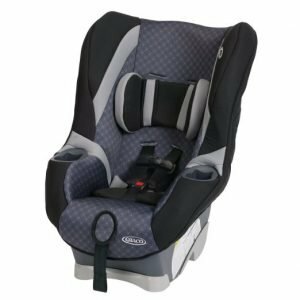 It may be a little difficult for you to achieve the desired recline angle with Graco brands, but the harness and latch system on the My Size 65 make it almost impossible to incorrectly install. In fact, if you are worried about improperly installing a car seat, then the simplicity and straightforward instructions on this model make it a contender. You can read a more in-depth review here. The second Graco car seat on our list is the Contender 65 . Like the My Size 65, the Contender can serve as a car seat for any child as small as 4 lbs. or as large as 65lbs. You should measure your vehicle before you purchase the Contender—it has a whopping 27 inch depth, making it a tight fit for most cars. It also comes with a cup holder on the baby’s right-hand side, and you have three color options to choose from. All Graco models have the same five-point harnessing system, which is easy to master even for first-time parents. As you might imagine from the price tag, the Contender is a small step down from the My Size 65. The main culprit: a clear decrease in the amount of padding for your child, especially in the neck and torso. The decrease in padding is only an issue when it comes to comfort, not safety. If you have a baby that needs a lot of cushioning, then you might consider spending the extra $40 for the My Size 65. If your child seems to be happy on any soft surface, then save your money and purchase the Contender 65. You can also read a full review here. The third and final Graco model that you should consider is the My Ride 65. Weighing at only about 16 lbs. and with a depth of just over 22 inches, the My Ride 65 will easily fit almost any vehicle. 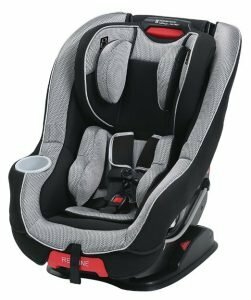 Although this car seat represents a step down in price, it has many of the same features as the My Size 65. It weighs less than 16 lbs. and comes with the exact same tethering/buckle system for your little one. It also has comparable safety ratings in terms of protecting your child from injury in the event of a car crash. It even has two cup holders instead of just one. The most significant drawback concerns the car seat’s relative lack of cushioning for the baby’s head and body. It should be quickly noted, however, that the padding only affects the child’s comfortability, not safety. In fact, the straps touch the baby’s skin when he/she is sitting in the seat, which may be a problem for sensitive skin. Taking these things into account, the Graco My Ride 65 is a solid choice for the comparatively low price with many of the same features as the more expensive model. 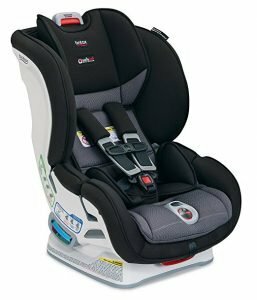 Another well-known brand is Britax, which offers a range of car seats that fit any budget. 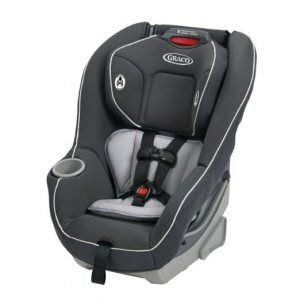 The Advocate is at the top of our list because it is a premium, high-end car seat, and it is the most expensive model Britax has on the market. 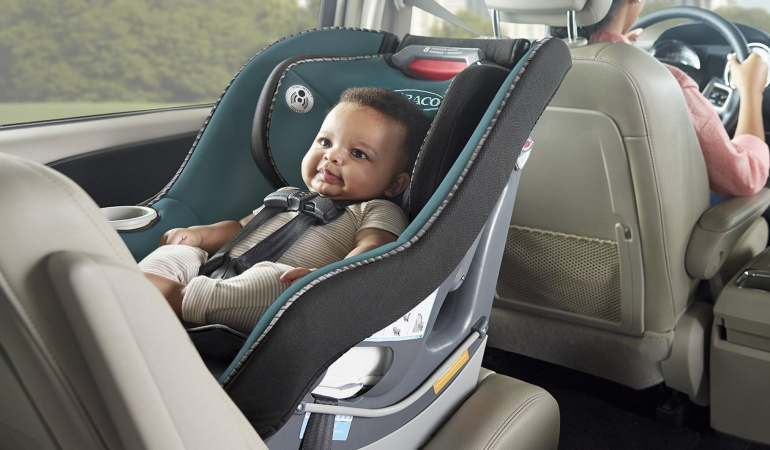 Weighing in at over 30 lbs., the Advocate is a large car seat designed for children who weigh up to 65 lbs. As you might have guessed from the price, the Advocate comes with the most advanced and sophisticated padding technology on the market. The seat has three layers of side impact protection, a patented ClickTight installation system, and an EZ buckle system. It even has an indicator to tell you if your child is securely fastened in the seat. Most impressively, the Advocate also puts a premium on your child’s comfort. The car seat comes fully loaded with 14 adjustable headrest positions and a harness that does not touch the skin for most passengers. I should mention that the car seat feels very sturdy and durable, giving parents the peace of mind that their child would be kept safe in a traffic accident. A step down from the Advocate, but still in the Britax family, is the Marathon. This unit has many of the same features as the Advocate, but it is a little lighter at 28.4 lbs. Most parents find that they use only three or four specific angles for their child’s headrest, so do not put too much emphasis on the fact that the Advocate comes with 12 pre-set angles (compared to 14 for the Advocate). The only other significant difference between the two models is the level of side impact protection—the Advocate only has one. The real question comes down to this: is spending an additional $78 worth getting two extra layers of protection? If you have the money, the answer is unquestionably yes. Britax makes car seats that can fit any budget, like the Roundabout . This model comes with 3 reclining positions and an easy-to-use five-point harness system. 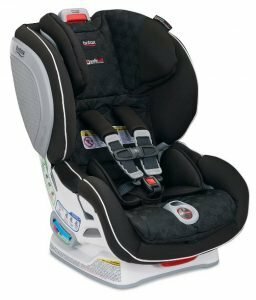 The Roundabout represents a basic, entry-level car seat in the Britax line, but it still comes with several important safety features. It has a layer of side impact protection combined with what the company calls a “SafeCell” impact-absorbing base. Although the seat’s frame is made of steel, the unit only weighs 17.6 lbs., which ranks it as one of the lighter models on the market. The car seat’s depth, however, comes in at 26 inches, which is on the longer side and may not fit every vehicle. Unlike the Graco models discussed earlier, the Roundabout is only suitable for children over 5 and under 55 lbs. These restrictions mean that the lifespan of the car seat will be slightly less than many other car seats on the market, which accommodate a child weighing up to 65 lbs. 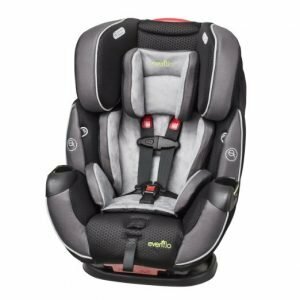 Evenflo makes some of the lightest car seats today, and the first one on our list is the Evenflo Tribute LX Convertible Car Seat, Saturn. The Tribute LX is specifically designed to meet all federal safety standards while remaining compact in size and weight. As you might expect, the lower price tag comes with some considerable tradeoffs. First off, the Tribute does not have any cup holders. More importantly, this model has considerably less padding both around the head area and on the sides than other car seats on our list. Spills will also be much harder to clean up on this model since the fabric is not machine-washable. A clear advantage in favor of the Evenflo Tribute LX is certainly its mobility. If you travel frequently or need to purchase a car seat that you know you must take through an airport, then the Tribute is a clear winner. But if you are shopping for a traditional car seat that will spend its entire lifecycle in your vehicle, then another model on our list if probably a better fit. Another convertible car seat made by Evenflo is the SureRide. Weighing only 14 lbs., this model is a clear step up from the Tribute. 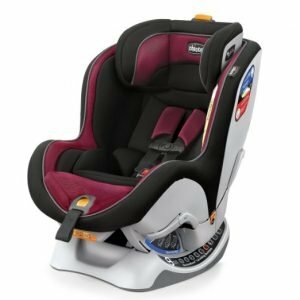 The Evenflo SureRide DLX convertible car seat Paxton model comes with more padding, and the removable body pillow gives it an added level of comfortability. The shoulder straps have six different positions, allowing you to find the right fit for your child. At the same time, the straps look rough to the touch and would probably irritate sensitive skin. Evenflo claims that all its models pass stress tests involving “energy levels approximately 2 times the Federal Crash Test Standards.” Don’t let this marketing tactic fool you—every car seat on our list undergoes a variety of rigorous tests both through the federal government and in each company’s product development division. The Evenflo SureRide DLX offers the same level of protection as other models on our list, and if saving money or finding a convenient portable unit are your primary goals, then the Tribute is probably the better choice. 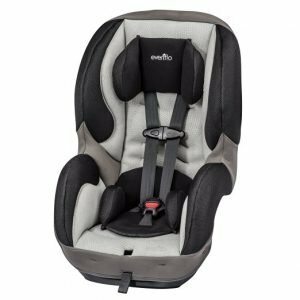 Evenflo manufactures several car seat models that give Graco, Britax and Chicco seats a run for their money. 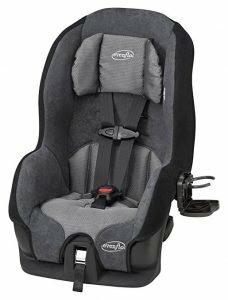 The Evenflo Symphony convertible car seat is the perfect model for parents looking to purchase a model that can grow and adapt as their child changes. Designed to fit babies as small as 5 lbs. but versatile enough to accommodate a child as heavy as 110 lbs., the Symphony promises you can install it in your vehicle in under 60 seconds. The model has a unique self-retracting latch system, which lets you know when your little one is safe and secure. The Symphony boasts three full layers of side impact protection as well as two cup holders. Compare prices and shop around for different fabric colors—you can find this model for as little as $170 on Amazon in a turquoise blue color (and if I’m honest, it’s not the most attractive color available). 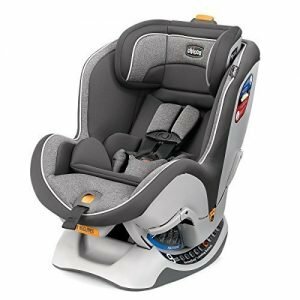 Chicco is probably the most widely recognized brand in baby and infant transportation, and as you might expect, the company offers some of the most highly regarded units available today. At the very high end of the market is the Chicco Nextfit Zip. Weighing precisely 25 lbs., the Nextfit Zip accommodates infants as small as 5 lbs. or children as large as 65 lbs., making it a versatile and long-term transportation solution. Chicco’s latching system makes it easy to install and secure, and the six-position headrest comes with nine different angles (again, most parents probably use only three or four). One significant drawback for the Nextfit Zip is that it lacks cup holders, unlike some of the other models on our list. There is however a removable cover over the car seat that you can throw in the washer. This feature sets the Nextfit Zip above the rest. Chicco’s Nextfit CX (without the “Zip” in the name) is the exact same model as our previous entry, but you cannot remove the cover. The key question for parents to consider when comparing the two: is spending an additional $27 worth the ability to wash the car seat? The answer to this question depends entirely on your individual parenting style and preferences. There’s no doubt that if your child needs a drink or some food while he or she is riding in the car, then the ability to wash the car seat itself is probably worth the extra money. Most parents make these purchasing decisions before they deliver the baby, and it’s very common to request a car seat as a gift for a baby shower. If that’s the case, then I would recommend going for the Nextfit Zip. 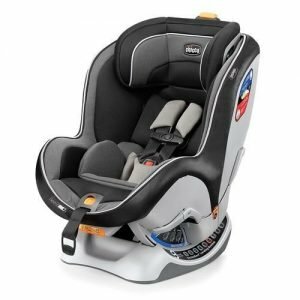 The final model on our list of best car seats is Chicco’s Nextfit (without the “CX” or the “Zip” in the name). This model costs about the same as the other two, and it comes with many of the same features. An important difference that you should consider is seat depth. The Nextfit is shallower with only 20.5 inches of depth compared to 26.5 inches for the CX model. Five inches may not seem like much, but it can be critical depending on the size of your vehicle. If you drive a car with smaller backseats, then the five extra inches of space can make the difference between easily getting into the car or a struggle to strap your child in. Make sure that you measure your vehicle first, and if you still aren’t sure what you should get, opt for the narrower model in the Nextfit. All things considered, the best convertible car seat on the market today is the Chicco Nextfit Zip. Customers who can afford the high price tag will not be disappointed by the product’s versatility and durability. Even though the model lacks a cup holder, the machine-washable external layer ensures that the Nextfit Zip can withstand years of use. The best narrow car seat is the MySize 65 by Graco. With a depth of only 19.3 inches, you should be able to easily fit this unit into any standard compact vehicle. The built-in cup holder is a bonus that will keep your child happy on long car rides. The best lightweight car seat on our list is the Evenflo Tribute. It puts a premium on size by offering all the federally mandated safety requirements without any of the extra weight. If you plan on installing and removing a car seat multiple times, or if you are planning to fly with your infant, then the 9.1 lbs. Evenflo Tribute is the right model for you.